Vienna is a premium responsive WordPress theme. 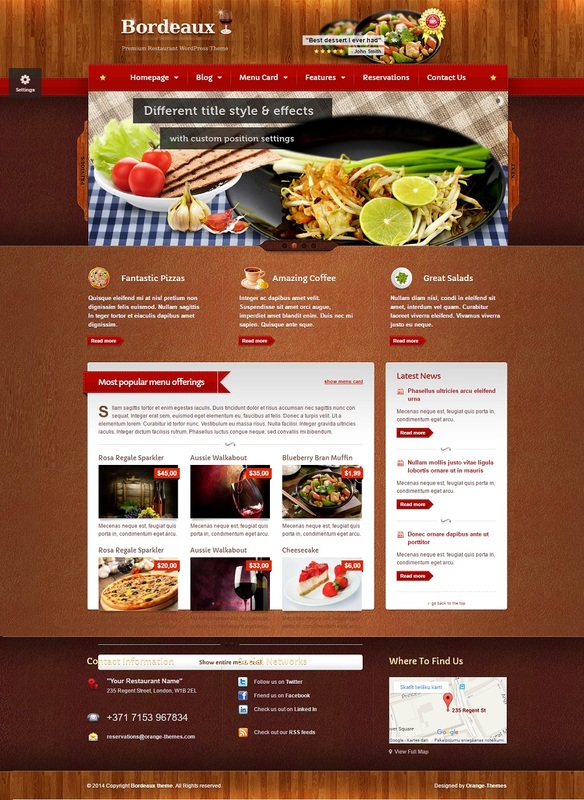 The theme is suitable for restaurants, bars, catering, hospitality industry and food bloggers. Vienna is build on responsive Twitter Bootstrap 3 framework and Redux options. Latest coding techniques HTML5 and CSS3 have been used. Woocommerce and WPML ready theme. Menu system, retina ready, events system and much more amazing features are included to make a stunning website. 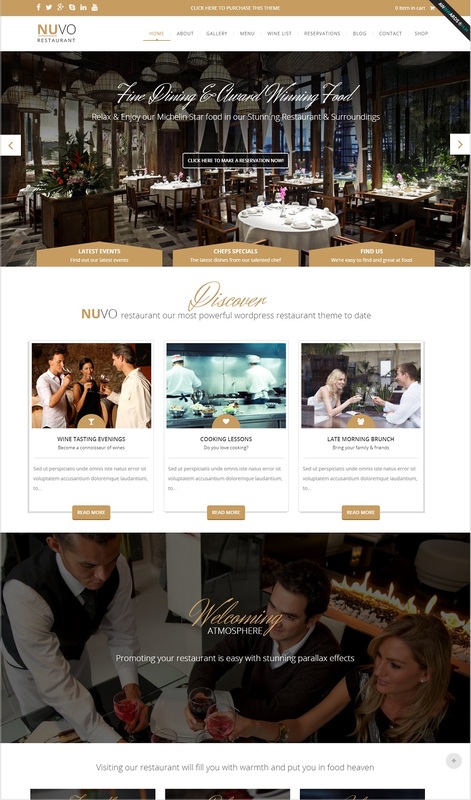 Nuvo is a responsive wordpress theme suitable for restaurants, cafe shops , coffee shops and bistros. The design is modern and elegant. It has a smooth parallax scrolling. The menu builder allows you to customize menus. Reservation system ensures efficient table booking. Events can be showcased on your website. Woocommerce compatibility ensures you to sell products online. Free premium plugins include visual composer ($30), revolution slider($18), essential grid($18). Nuvo is translation ready theme. Your website will look sophisticated on installing this theme. Gourment is a powerful responsive wordpress theme. You can use this theme for restaurants and cafe shops. The design is modern and sophisticated. There are 8 homepage layouts with menu options at top or side. It includes slider revolution and visual composer . 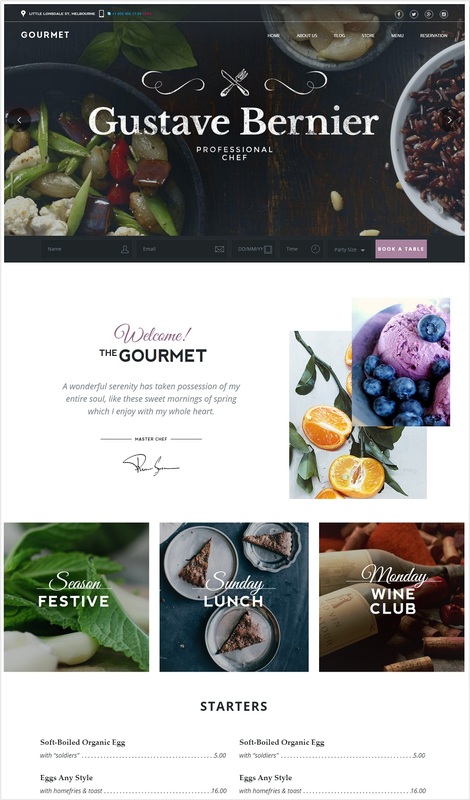 Gourmet is translation and woocommerce ready theme. There are unlimited color and header options. 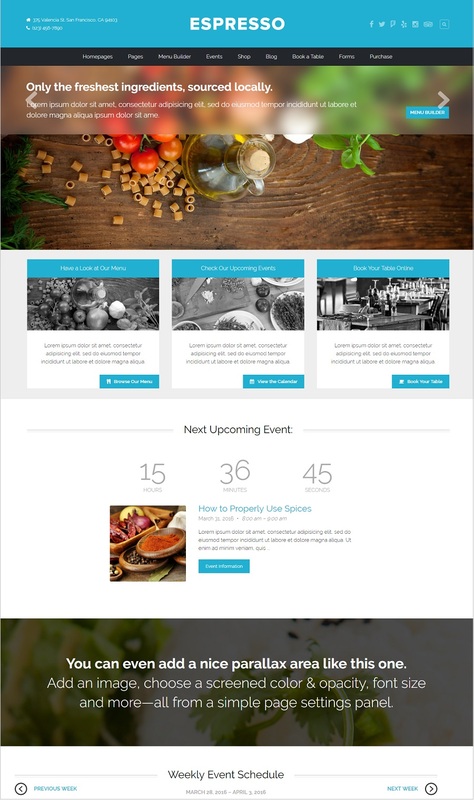 Gourmet is SEO ready theme. This amazing theme will make your website look elegant. Take a break is a responsive WordPress theme. Suitable for restaurants, cafe shops and bars. This is a one page theme based on twitter bootstrap framework. SEO optimized theme is built with HTML5 and CSS3 coding. Includes 7 present templates, themes options panel , smooth parallax effects and much more to make an amazing visitor experience. 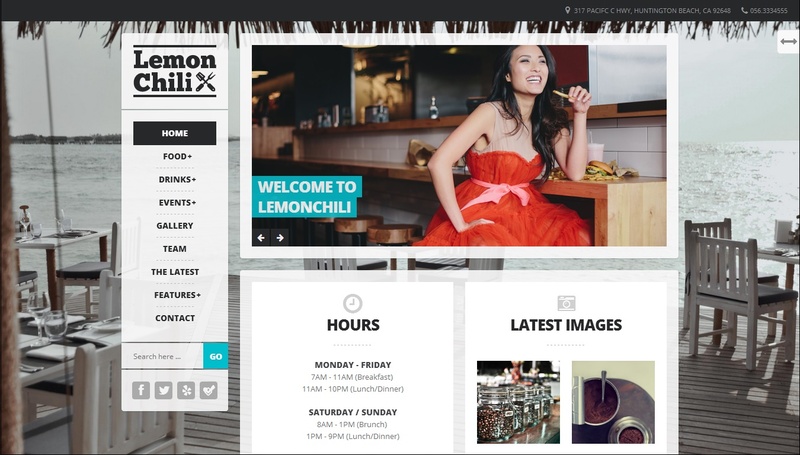 LemonChili is a responsive WordPress theme. The theme is suitable for food related industry- restaurant, cafe shops, bars, club and event related websites. Unlimited menus for food and drink can be created. Homepage display of business hour, events, business timings can be done via customized widgets. LemonChili is SEO optimized. Plenty of options to make an amazing visitor experience. Lambert is a responsive wordpress theme. Suitable for restaurants, bakery, pubs, personal chef websites and cafe shops. The design is modern and clean. It has 6 homepages, free premium plugin visual composer , awesome parallax, woocommerce compatible, unlimited color options, and much more to make a great looking website. 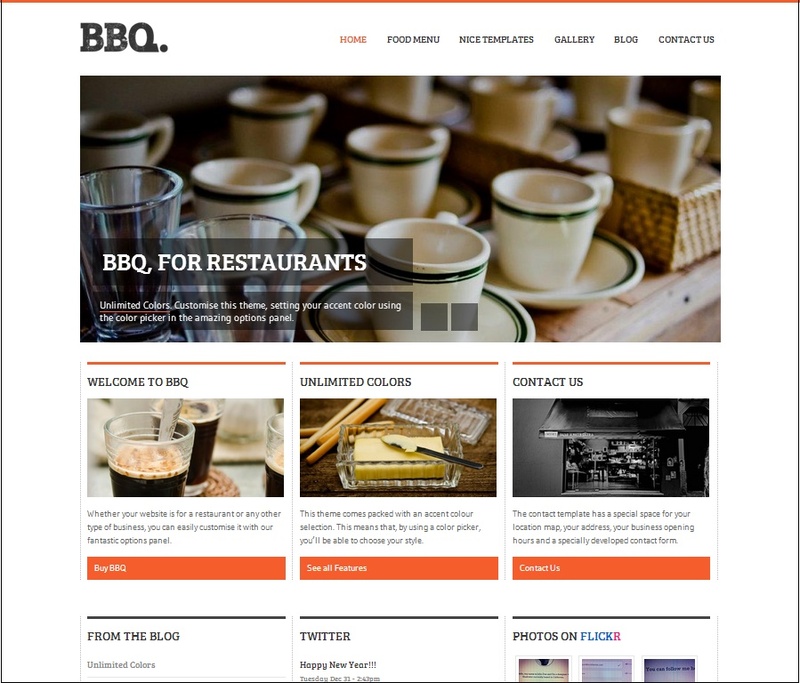 Forked is a responsive wordpress theme ideal for setting up food and event related websites. Hotel, restaurant, cafe shops, bistros, wine shops etc. It has unlimited color options, table reservation system, events, calendars and much more to make an impressive website. 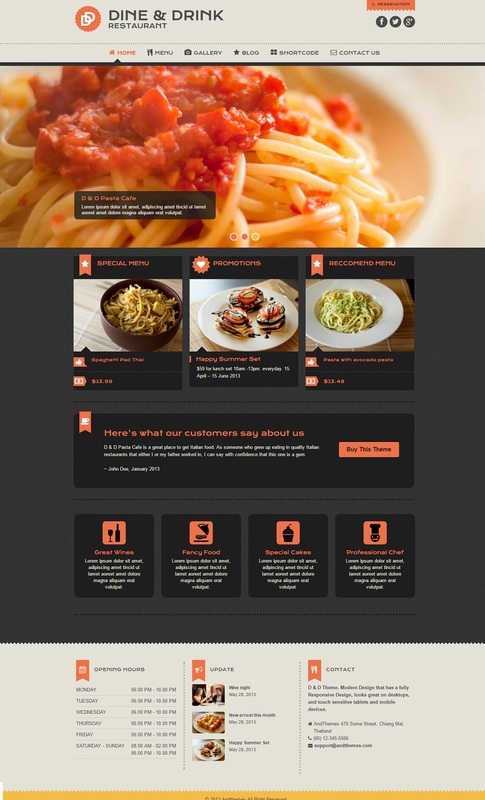 Tomato is a responsive WordPress Restaurant theme. The design is creative and modern. Tomato can be used for wide variety of food websites – restaurants, cage shops, bakery, fast foods etc. It has 4 homepage layouts, 4 food menu styles, 8 shop pages, parallax and much more. 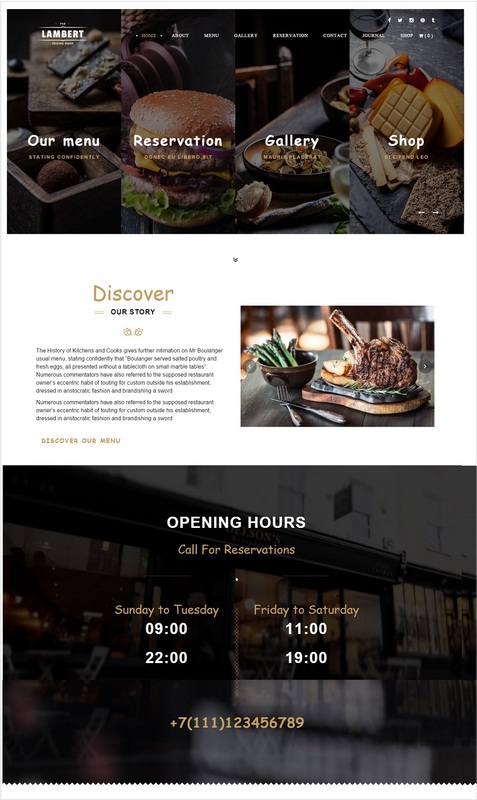 Pluto is a premium restaurant wordpress themes. 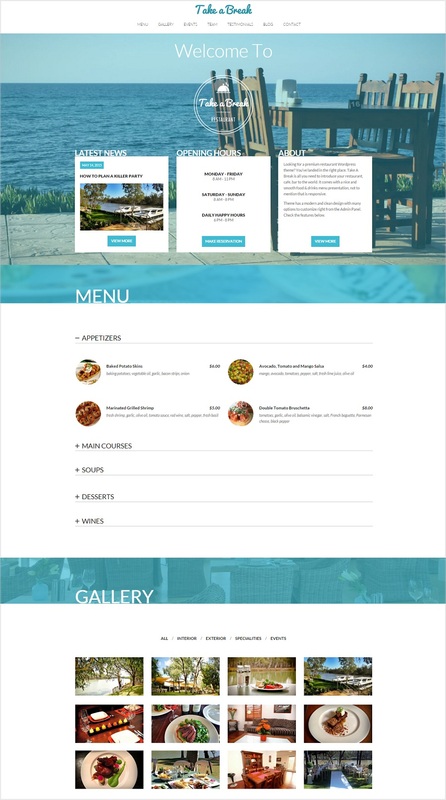 Suitable for setting up cafe and restaurant websites. It has 3 skin layouts, 7 sideshow effects, drag and drop home page builder and lot’s more . 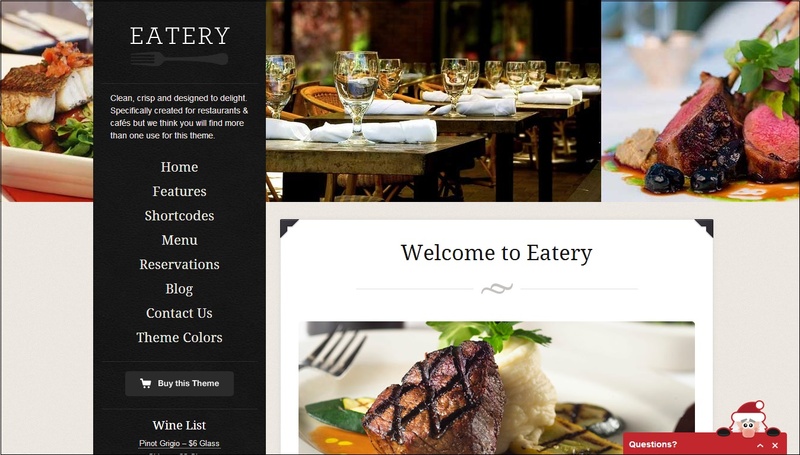 Eatery is a responsive restaurant wordpress themes. Suitable for setting up websites for restaurants and café shops. The design is clean and professional. There are plenty of customization features, shortcodes and tools. Eatery lets you create food menus and events. There are 6 theme skins. 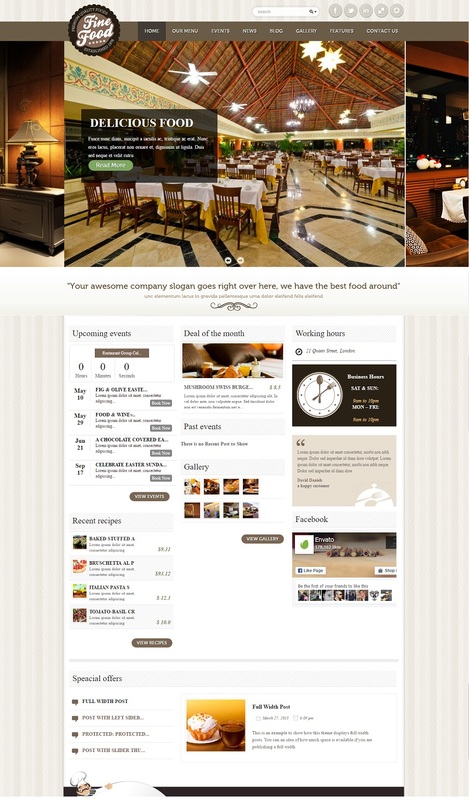 Eatery is built using latest HTML5 and CSS3 coding. 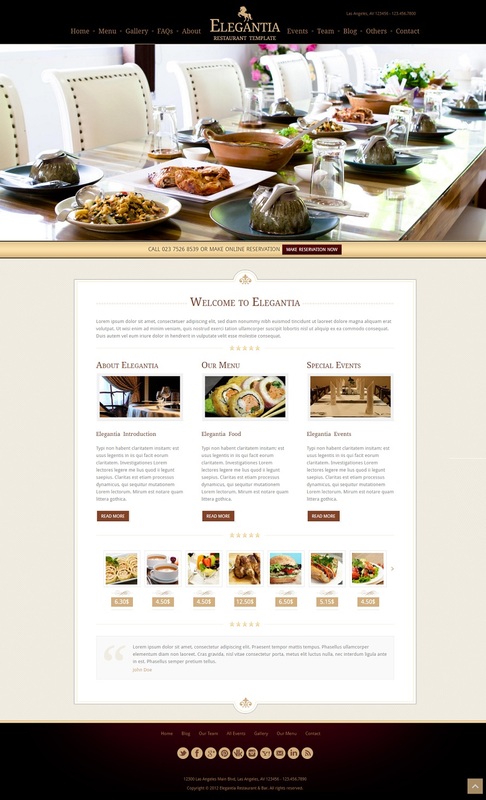 Elegantia is a responsive restaurant wordpress themes. 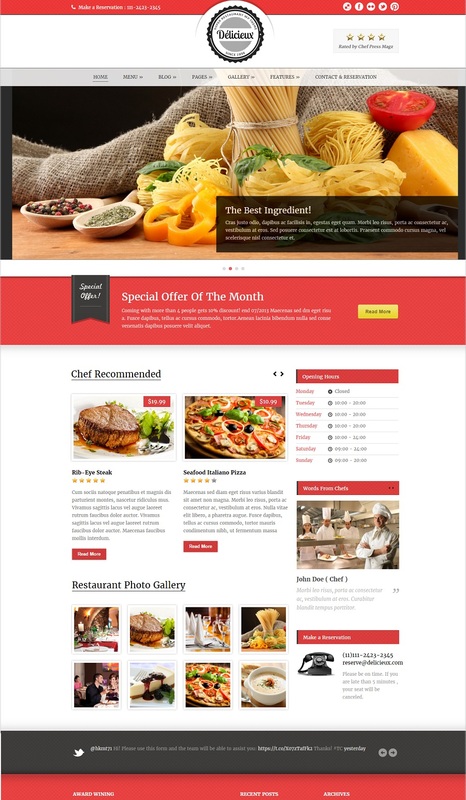 Besides using it to make restaurant website , you can also use it for cafe shops. The theme is SEO optimized, includes food menu modules, reservation templates, shortcodes and various features to run a restaurant business. 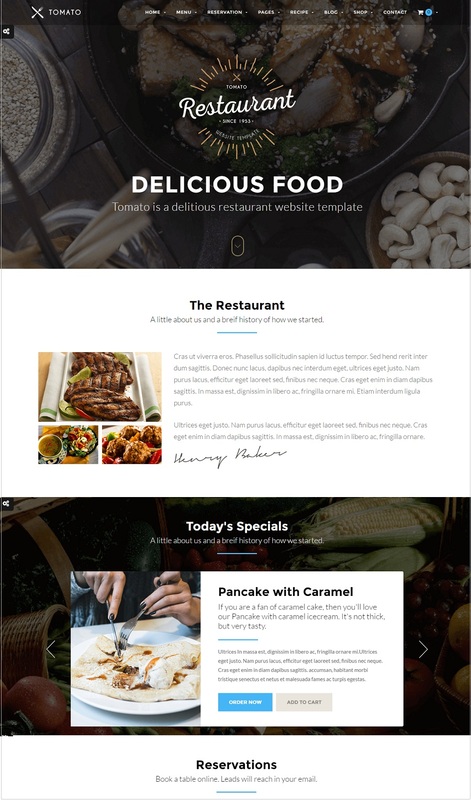 Delicieux is a premium restaurant wordpress themes. The theme is responsive , SEO optimized, unlimited color options, 6 footer layouts and many other features. Dine & Drink is a responsive restaurant wordpress themes. 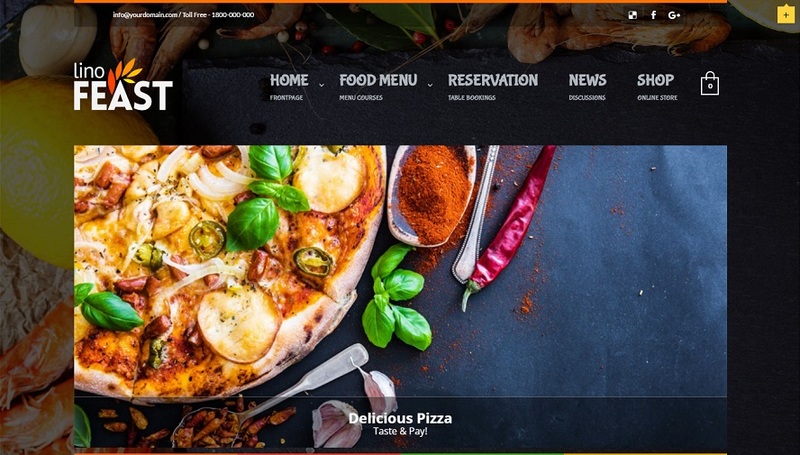 The theme is ideal to set up websites related to restaurant, cafes, bakeries, fast food outlets and other food businesses. Drink & dine is built by using HTML5 and CSS3 coding. It has unlimited color options, over 6 color schemes, food menu options, pricing/badge icons, 3 menu style options, and much more. 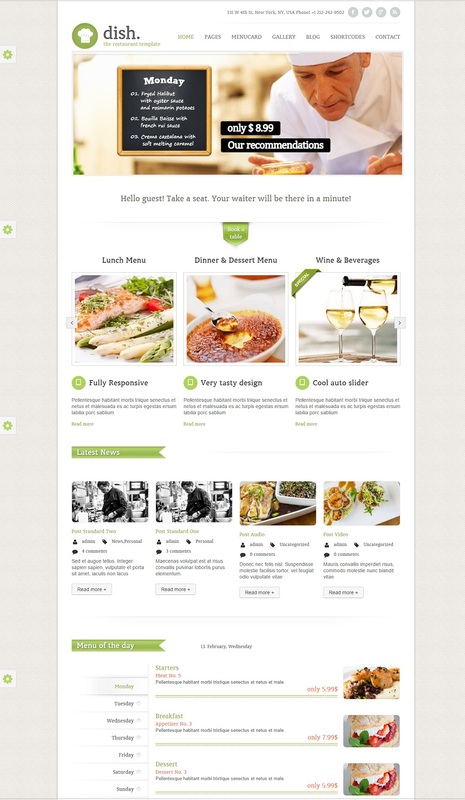 NEM is a premium responsive theme suitable for restaurant businesses. It has a easy reservation system, amazing menus, woocommerce compatible, awesome parallax effects , includes free revolution slider plugin, unlimited color/skin options and lot’ more to make a modern smart website. Fine Food is a responsive restaurant wordpress themes. You can use this theme for hotels, restaurants, cafe shops , tea/ coffee shops etc . The theme has events management system, page builder to customize, unlimited colors and lot’s more to make a rich beautiful website. 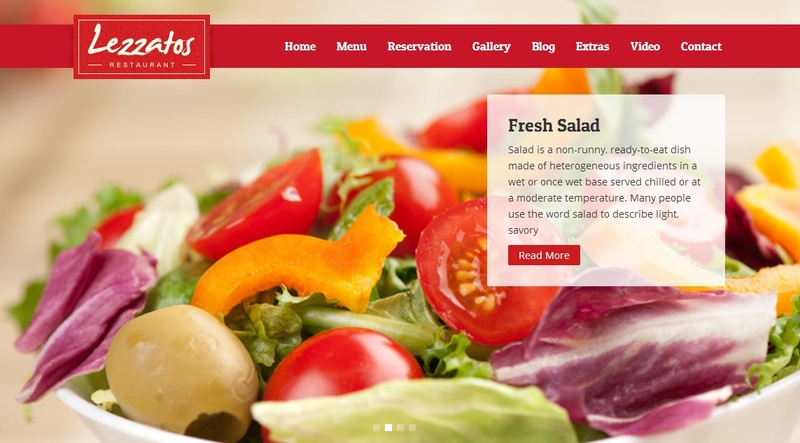 Lezzatos is a responsive restaurant wordpress themes suitable for cafes & restaurant. Easy to customize the theme. There are lot of amazing features like 7 slider effects, social media widgets, reservation forms, menu options, plenty of shortcodes etc. Espresso is a premium responsive restaurant wordpress themes. It includes free premium plugins- worth $ 176- Envira Gallery , Visual Composer , Slider Revolution. Woocommerce compatible, over 35 color customization etc are other great features this theme includes. 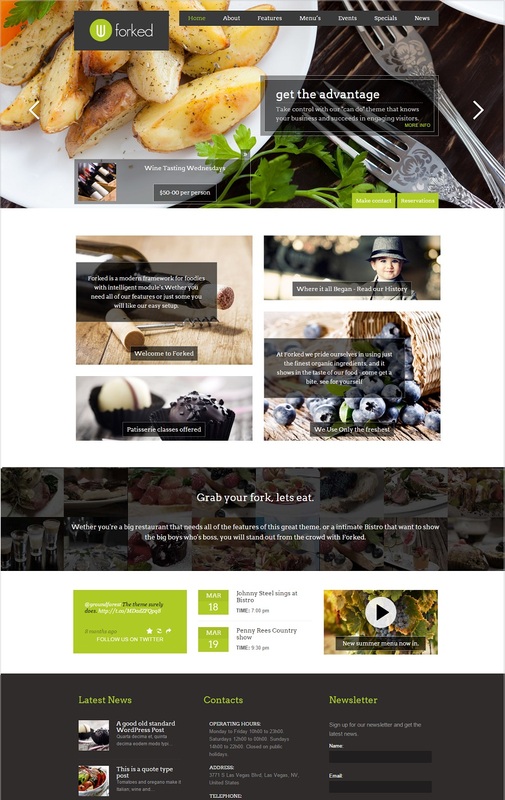 Dish is a responsive wordpress theme suitable for food related businesses. The design is clean and modern. There are 5 wordpress templates, includes free revolution slider plugin, open reservation table, shortcode generator with over 60 shortcodes included, 8 widgets, unlimited colors, translation ready, flex sliders etc. Dish is built with HTML5 and CSS3 coding. 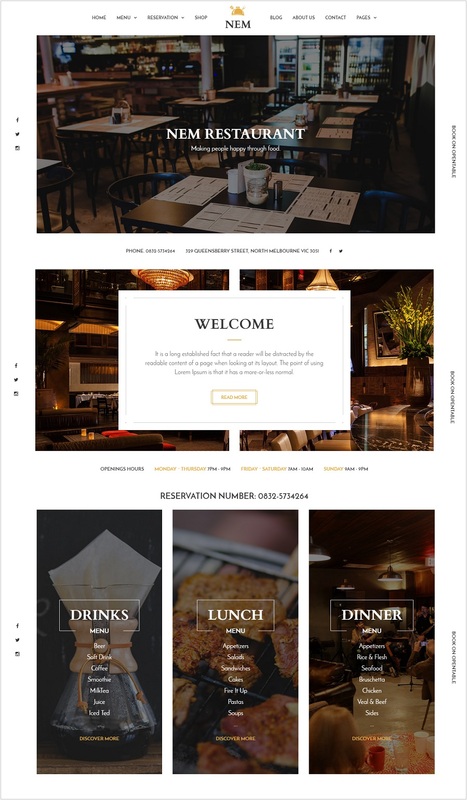 Bordeaux is a beautiful premium restaurant wordpress themes . The theme is responsive and has a pixel perfect design. Ideal to set up your restaurant website or food related blogs. Can be customized with ease. Includes free premium plugins visual composer and layer slider 5. It has a menu card design, unlimited side bars, table reservation system, woocommerce compatible, translation ready and much more.